Contest #11--November 2013. PLEASE Thumb this list to keep it seen! 1) Entry fee is 1 gg. Please tip this header. 3) Do not discuss answers. Do not post your answers on this geeklist until after it ended! 4) On November 30th December 2nd (or soon after), I will tally the results and post them, and deliver prizes! Redistribution of prizes to have more winners! --1st place = 40% of all tipped. --2nd place = 20% of all tipped. --3rd place = 10% of all tipped. --4th place = 5% of all tipped. --5th place = 2% of all tipped. Note: Any extra donations will automatically be added to the prizes. 5) You may enter more than once. However each new entry must have 11 NEW responses that you have not entered before. You can only win once. (Example: you submit two responses and win 1st and 2nd. You officially will win 1st and your 2nd entry will be ignored and the next person will win 2nd) BTW--this will never happen. 7) I will allow comments in order to take suggested questions for next month. 9) A tiebreaker will be inserted as number #11. Closest will win. If still tied, priority given to someone under tiebreaker. If still tied, well then you are tied! 11) When you are finished, please take a moment and thumb you favorite questions. This will help me make the next contest even better! Subscribe to this thread for new contests. I found this backstage, an over-sized hat. It's funny! To be eligible to win gg, you must tip 1 gg prior to results. Feel free to play for the price of one thumb otherwise. Name a game that takes a while to set up. Name a game that has a bird(s) in it. Name an expansion that you would qualify as a "Necessary Expansion." Name a game whose title just sounds boring! 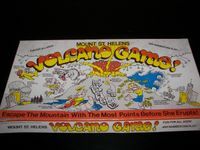 Name a game with a Volcano. 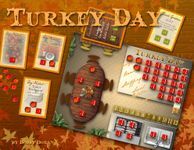 Here is a list of the 10 most voted on games on BGG. How many of these 10 games does the average BGGer own? Name a game with a good insert. Name a game that comes in a tin. SPECIAL RULE: The most popular response will get no points!!! Try to answer with the 2nd most popular response. Name a city that is always used on a board game map. Name a game that starts with the letter "C"
A is for Agricola with 81% of the responses. B is for Brass: Lancashire with 39% of the responses. Winner (Person who sets the tiebreaker) gets 5% of the gg. Pick any whole number between (and including) 1 and 40. --The smallest number that is not repeated will be set as the tiebreaker answer. --In case of any tie, the person closer to the tiebreaker number wins. --In case that is a tie, preference will be given to the response under the tiebreaker number. --If that is still a tie....then it is a tie.